By contract the Water District is required to adopt a Drought Contingency Plan that is consistent with plan adopted by the City of Corpus Christi, manager of the regional water supply. Corpus Christi adopted a new plan on May 30th and the District has updated its plan to be consistent with the City's. State regulations require that these plans be updated at least every five years. The 2017 plan better reflected the region's expanded water supply system. It is intended to help ensure the region's water security and to strive to see that all customers are treated equitably across the seven counties that rely on the region's multi-source surface water system. The new plan recognizes the additional water supplies coming by pipeline from Lake Texana on the Navidad River (completed in 1998) and from the Colorado River at Bay City via Phase II of the Mary Rhodes Pipeline (completed in 2016). The plans set out how water use restrictions will be triggered and how they will apply to customers. This includes four stages of drought restrictions based on the amount of water in storage in the region's reservoir system. By contract each of the cities and water suppliers buying water from the District must have plans that are at least as restrictive as those adopted by the District and the City of Corpus Christi. District wholesale customers include the cities of Odem, Taft, Gregory, Portland, Ingleside, Aransas Pass, Rockport and Port Aransas, plus industrial customers, Rincon Water Supply Corp. and Seaboard Water Supply Corp. The Conservation Plan is due for updating in 2018. The decision to trigger incremental drought response stages is based on the combined reservoir storage levels of Choke Canyon Reservoir and Lake Corpus Christi (CCR/LCC) established in a 2001 Agreed Order with the Texas Commission on Environmental Quality relating to inflows into the Nueces River Delta and Nueces Bay. Stage 1 is triggered when combined CCR/LCC water storage declines below 50% or Lake Texana storage declines below 40%. Customers are reqested to voluntarily conserve water including limiting lawn watering to once per week. The goal is reduce overall demand by 5%. Stage 2 is triggered when the combined reservoir storage declines below 40%. Manadatory Stage 2 restrictions include limiting lawn watering to once per week on a designated day. However, irrigation of landscaped areas is permitted on any day if it is by means of a hand-held hose with positive shut-off nozzle, a faucet filled bucket or watering can of five gallons or less, or a drip irrigation system with a positive shut-off device. Customers irrigating with an irrigation well should provide a legible sign prominently posted. The use of water to maintain the integrity of building foundations is only permitted by use of a hand held hose or drip irrigation. Stage 3 is triggered when combined CCR/LCC storage drops below 30%. 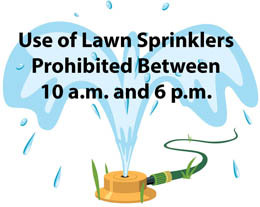 Additional water use restrictions will include limiting lawn watering to once very other week. And watering of golf course fairways with potable water is prohibited. The City and District may require water providers to impose a drought surcharge of up to 100% of the total monthly water bills may be added to a customers bill to deter discretionary water use. Stage 4 is triggered when lake levels drop below 20%. Customers will be required to comply with restrictions on non-essential water use. Water meters may be disconnected for willful violators to prevent deliberate wasting of water. 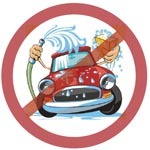 Restrictions will prohibit irrigation of landscaping, filling of pools and washing vehicles. This condition is to be declared when a water supply emergency is caused by a major line break, system failure, transmission system limitation or system contamination. It would be rescinded as soon as the event is resolved.